The future looks bright. And also a lot like the past. 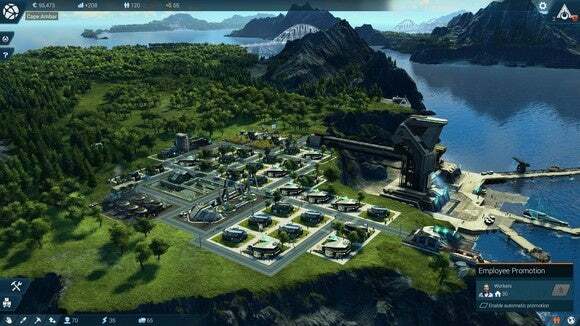 Anno 2205 is the latest iteration of Ubisoft’s long-running city builder/sometimes-an-RTS series, this time taking us even further into the future than the previous Anno 2070. 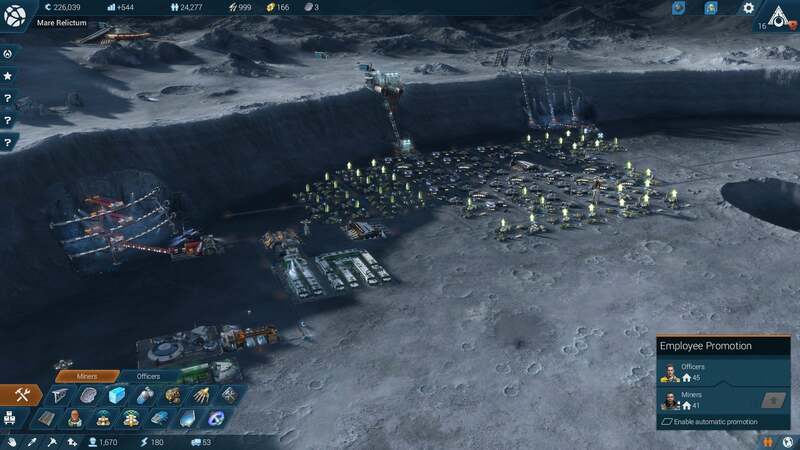 In the process, Anno 2205 takes us to the pseudo-arctic and (eventually) to the moon. You’re the CEO of a newly-formed corporation—part of the Lunar Licensing Program, which aims to go all John F. Kennedy and establish permanent human settlements on the moon’s surface. The goal? Harvest Helium-3 for cheap and plentiful energy. This is the main conceit of the Campaign, and it’ll talk you step-by-step through setting up a viable, interconnected economy. Also there’s some barely-touched-upon stuff about Moon Terrorists or freedom fighters or whatever, but it’s pretty unintelligible and ignorable aside from a few (skippable) real-time strategy missions. The game is broken into nine main zones: Three temperate, three arctic, and three lunar. Each grouping produces different essential goods, from orchards to aluminum to the aforementioned Helium-3. 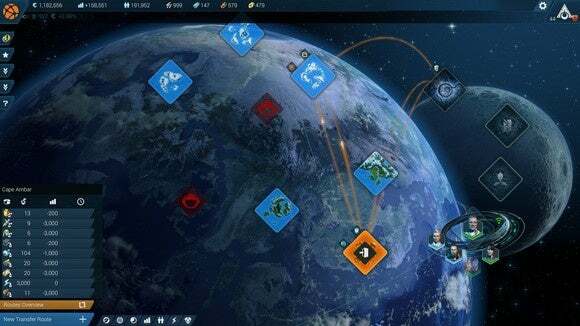 You’ll automatically gain access to one of each type over the course of the story, though you can eventually acquire all nine by buying them off your AI competitors. At review time I’d acquired seven of nine, though I’d only built up three of them. Even 15-20 hours in I’ve yet to run out of space in a single region, though one of my zones is getting close. The maps are big. Properly city-like, I’d say, though not on the same scale as Cities: Skylines. Temperate regions play pretty much like your standard city builder. Lay down roads, put in houses, build up your population, feed them, give them water, power their houses, et cetera. Once you have enough people in your town you can build more advanced technologies. Rinse and repeat. The story continuity seems to hinge on what we already saw in 2070, so maps are chains of islands instead of uniform land masses—thanks, global warming—leaving precious little room for the agriculture you so desperately need to sustain a massive population. 2205 postulates a future in which ecology-loving techies have devised a way to push back against nature, manipulating the atmosphere at the poles to drastically cool off the region and rebuild the Arctic environment. Here, the challenge is heat. In order to harvest important resources like molybdenum, you’ll need to keep the population warm. Factories provide the necessary heat, so homes will cluster around industrial areas. Eventually you’ll build up your Temperate and Arctic regions enough to construct an Orbital Spaceport, enabling you to claim a Lunar region. The challenges are obvious, from oxygen to food supply, but your construction constraint is actually asteroids. All buildings must be placed underneath a force shield, protecting your fragile colony from constant buffeting by space debris. These are interesting restrictions, leading to different patterns in each of your cities. My temperate region, for instance, spread out quickly. I had a whole island packed with residences, outsourcing my farms and industry across a bridge to a second island. But in the Arctic? Those factories support life, meaning you end up with a trunk-branch pattern—factory in the center, surrounded by as many homes as possible. And the moon tends to be compact, given that force fields are fairly expensive. All regions run simultaneously. Production doesn’t pause in your Lunar colony just because you’re paying attention to your Temperate region. You can swap between cities at any time, though you’ll have to endure a twenty-second load-in, which meant I switched less than I probably should have. The map looks seamless, but there’s a tedious load-in every time you switch between regions. Your cities are also interdependent, to some extent. Your Arctic citizens need vitamin-rich Juice, your Temperate regions desire cybernetic implants, the moon wants diamonds. In theory this should require you to expand all three regions in concert, though in practice you’ll often rack up a huge debt of goods without realizing it, then switch to the source region and frantically expand production until you fix the imbalance. It’s worth noting all three regions look fantastic. Graphics are hardly the most important part of a city-builder, but there is a certain pride in building something that looks good. While parts of Anno 2205—like residences—could use more variation, it’s impressive to zoom in and see all the moving parts: factories full of conveyor belts, streets topped with the obligatory flying cars, little lunar rovers kicking up moon dust with Earth silent in the distance. The Anno series lacks some of the micro-simulations I enjoyed in Cities: Skylines, like traffic and pollution. But it at least does a good job faking that level of detail, with enough going on that the world feels properly alive. It’s a game that’s oddly compelling, though eventually as repetitive and micro-management heavy as the rest of the series. The Anno style of city-building is like a ship with a dozen holes, all of which need to be plugged. It often feels less like a “real city” and more like machinery. Boost this bit, then boost the others until they’re balanced. Then jump to the next region, boost and balance it, and so on. 2205 hasn’t fixed that feeling of rote compulsion, though it does make the process a bit friendlier with a new “Move” feature and Modules. First, Move: Using 23rd century magic, you can pick up any building in Anno 2205 and transport it to a new location, penalty-free. It’s incredibly useful once you’ve gotten a bit of money and want to fix your original Temperate zone so the initial rice fields and orchards and sunflower fields are on the outskirts, not in the heart of your densest residential area. And it’s doubly helpful when adding Modules. EA’s SimCity reboot was a total mess, but one thing it got right was the idea of expandable buildings. In the real world, rarely do companies build an entire new factory to increase capacity. They expand and retrofit existing facilities. SimCity tried this, and Anno 2205 follows. Power plant not producing enough energy? Add a new turbine. Space cafeteria too small? Add a second hall. It’s cheaper and easier than building something new. Occasionally you’ll take a break for some RTS-lite action. Without the Move feature, this whole process would be a nightmare when, for example, you realized you allotted space for three extra rice fields but the original building supports four. As it is, modules are merely annoying (instead of rage-inducing). My main issue involves gridding. If we agree Anno is mostly about optimizing systems, then its buildings are anti-efficiency. Industrial buildings rarely scale with homes, leaving you with awkward dead zones where nothing will fit. 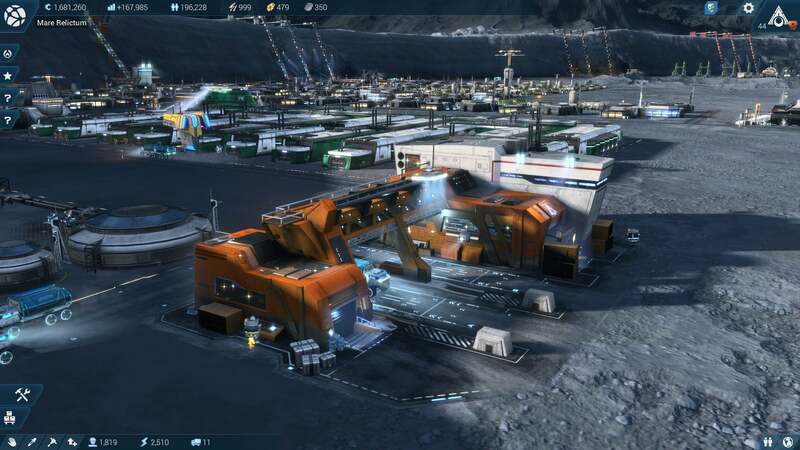 And while this is something that’s happened in basically every Anno game, it’s doubly frustrating in 2205 because of modules—many don’t even mesh well with their base buildings, leaving an overhang of one or two tiles when placed. Useless space. 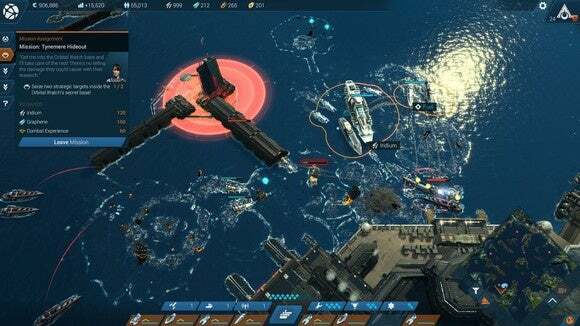 It has never been harder to build a good-looking layout in an Anno game. And modules aren’t even useful in an entire third of the game. 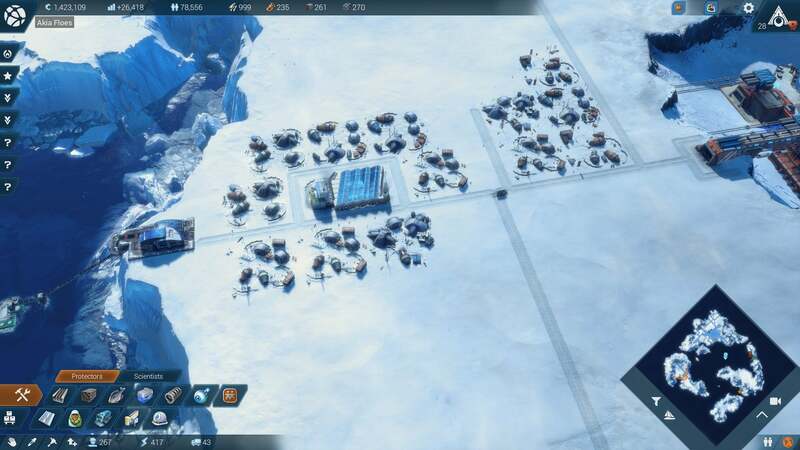 The Arctic’s heat-based constraint means you’re often better off building redundant factories instead of modules because you need the population areas—and because your factories are likely surrounded with homes, meaning a whole lot of Move-ing if you want to place even a single module. One last complaint: Anno has slimmed down its user interface quite a bit over the last few installments, which is in many ways a good thing. The text-heavy look of the older games is incongruous not just with modern game design but with the futuristic setting Anno’s leaned into lately. But I think 2205 goes a bit too far, with vital information masked in the interest of keeping the interface clutter-free. Cities: Skylines did a pretty great job of keeping the interface light while retaining a million and one different information overlays for those who wanted to dig. Anno lacks that depth. Or, at least, it lacks a way to see that depth. 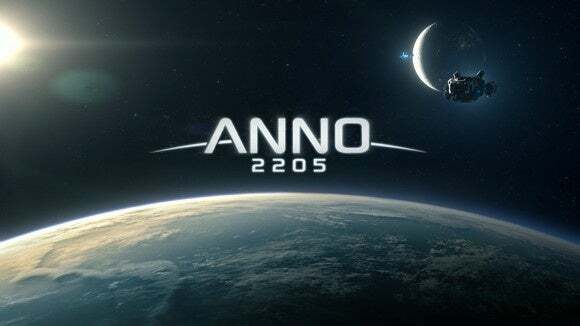 Anno 2070 was a pretty great game that, unfortunately, was hamstrung by an awful implementation of Tages DRM—specifically, one that limited you to three activations of the game and which would get screwy if you (for instance) replaced your graphics card, identifying it as a “new” computer. This was in addition to the already-annoying Uplay. As far as I can tell, 2205 only requires Uplay. No Tages. I love Anno 2205’s surface-level ambition. 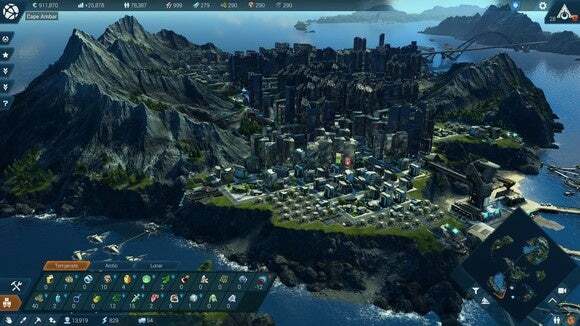 They took a lot of the best things from EA’s mostly-bad SimCity reboot—modular buildings, multiple interconnected cities—and fleshed them out in ways that made more sense. Even running multiple cities on your own feels natural here, thanks to the fact each region plays differently. 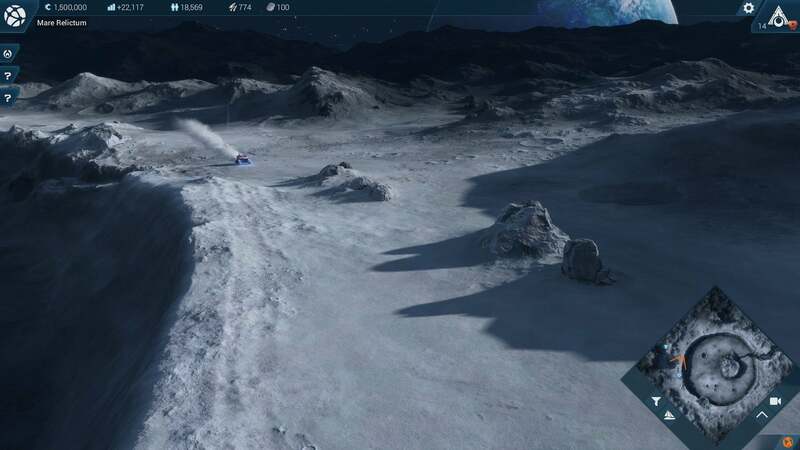 And I love the Arctic and Lunar settings. They not only look amazing, they also offer interesting constraints on the Anno formula. I feel like we get a lot of city builders where you’re constructing under optimal conditions—basically, 2205’s Temperate areas. It’s cool to see different regions, and the challenges humanity might face in the future. It’s an Anno game, though. If you’ve played 1404 or 2070 or what-have-you, then this will feel exceedingly familiar—especially once you hit the end-game optimization grind, which can be even more tedious when you’re trying to balance multiple cities at once. I’ve been addicted to 2205 all week, but remain disappointed Blue Byte doesn’t push its ideas further with each new entry. The future’s impressive. Just not quite as different as you might think. Anno 2205 is polished, clever, and Tages-free, but falls prey to the same repetitive, micromanagement-heavy end-game grind that's always plagued the series.